Bethel Methodist Church was formed in the year of 1912 by a small group of saintly men and women. The name “Bethel” was chosen because of the scripture of Genesis 28 meaning “House of God.” Mr. C. G. Hill of Cannon Mills Corporation (now Parkdale Mills) donated a lot on the corner of Hinkle and Fisher Ferry Streets and the late Mr. C. A. Russell, Sr. helped build the small frame building, which served this congregation for over forty years. A very prominent banker of Thomasville, Mr. R. L. Pope, donated the bell for the church, which was later electrically installed in the current church by the late George Smith. 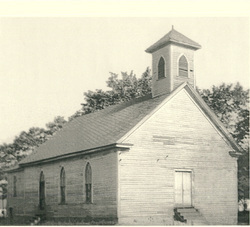 Bethel held its first service on Sunday evening, May 10, 1912 by a Reverend Parker. The Reverend Z. T. Bell was the first conference minister and the Reverend McRae Crawford was the last conference minister to serve in this building. The church was outgrowing this small building so on May 9, 1944 the Official Board authorized the Reverend D. A. Oakley and C. J. Myers to find a suitable building site for a new church building. Through the faith and leadership of the late Reverend C. O. Plyler a new building was on the drawing board and Craver and Essick Construction Company of Lexington, NC was hired to build the present structure. The church treasurer had only $20,000.00 on hand when construction began. On December 18, 1951, the footings were poured. The building was finished in 1952 at a cost of $75,695.09. The Reverend McRae Crawford held the first service in the new church on July 27, 1952. The church debt was paid off, the church dedicated, and the cornerstone laid on August 12, 1956. What seemed to be an impossible dream became a reality. A fellowship hall, consisting of a kitchen, large assembly-dining room and two rest rooms was constructed in 1957 under the leadership of the Reverend Harley Cecil. Construction was begun on September 16, 1957 at a cost of $10,000.00 and the mortgage was retired on August 16, 1959. Today, the building is being used by our Youth as a meeting and recreation facility and is now called “Youthtopia”. The year 1959 was the beginning of Bethel Methodist Church as a station church with its first full-time minister. Also in 1959 a wooded lot was purchased and a brick parsonage was built. This was done under the leadership of the late Reverend W. C. Clark. The mortgage on this building was retired in 1967. Bishop Earl G. Hunt, Jr., Dr. Charles G. Beaman, Jr. and the Reverend Grady N. Dulin held the dedication of the new parsonage on February 25, 1968. Bethel Methodist Church became Bethel United Methodist Church in 1968 when the General Conference made the ruling to merge the Methodist Church with the Evangelical United Brethren Church, thus adding United to the Methodist Church. In 1969 several improvements were made to the sanctuary building: a steeple, a colonial style porch, air-conditioning, new carpet, downstairs paneling, and a granite church sign. A few years later another remodeling program began and the choir loft and pulpit area were changed making the sanctuary more beautiful and functional. In 1984 a large wooden, lighted cross was constructed and erected directly behind the pulpit area and donated to the church by Bob Johnson in honor of Charlie Tobin. In 1998 the lot beside the church (the Moore property) was purchased. Several years later we purchased the adjoining land behind the church from Parkdale Mills. Other projects that have enhanced the ministry of the church include the purchase of a church van, a church bus, a new lighted marquee, a handicap ramp and a playground. In 2003, we purchased the Jean Jarrett house as our new parsonage. Extensive renovations to the new parsonage were completed within a few months. Bethel is growing and for all things accomplished and for all things to come, both spiritual and material, we give the praise and glory to God, through our Lord Jesus Christ.